The 410 Club has long been recognized for it's warm atmosphere and classic Art Deco décor. The 410 Club follows this rich tradition and continues to build on this distinguished heritage to be a private club with facilities and service second to none. The 410 club offers rich tradition with the distinguished private club experience. Our facility and services are topped only by our desire to please you on your special day. Because each event is unique, every event is customized to reflect your individual style and taste, incorporating elements such as exquisite culinary creations, fanciful florals and dramatic decor. 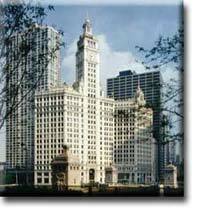 Upon completion of the south tower in 1921, the Wrigley Building was recognized as an architectural work of art and became the cornerstone for the development of the North Michigan Avenue business district. Over the years, it became known among Chicago's business and community leaders as a meeting place for fine food, friendship and good conversation. Bridal gowns and mother of the bride dresses. Historic landmark, with park setting, hosting special occasions, corporate events. Custom caterer for all wedding and corporate events. Specializing in gourmet stations and specialty beverage stations. Elegant grand open space for weddings and special events. Custom design of fine jewelry, diamonds, platinum, and white gold. Luxurious accomodations in the heart of downtown Chicago. Rising gracefully above Grant Park and Chicago's impressive lakefront, The Fairmont Chicago is located conveniently near major cultural attractions, the city's business and financial district and the world renowned shopping along the Magnificent Mile. The Fairmont Chicago offers its guests an ideal address for both business and pleasure. With beautifully appointed, extraordinarily spacious guestrooms and spectacular lakefront suites, The Fairmont Chicago offers a superior and distinctive array of amenities and services, including guest privileges at the adjacent Lakeshore Athletic Club, Chicago's finest health, athletic and spa facility. This Four-Star, Four-Diamond luxury hotel is host to some of the city's most extravagant galas and social affairs and provides excellent meeting facilities for intimate board meetings to major conventions. Whether your visit to Chicago is business or pleasure, we invite you to experience our personalized service in the comfortable, inviting setting of The Fairmont Chicago. Ancient and ethnographic arts from the Americas, Africa, Asia and Indonesia. Full bridal department and registry, can special order fabrics. Specializes in Engagement rings and diamond jewelry. Custom design wedding bands and engagement rings. Specializing in commitment ceremonies, corporate events, social gatherings. Specialize in finest works in contemporary glass. Twenty-nine years ago Habatat Galleries had the strength, courage and vision to create a place where young artists experimenting in glass could express their creativity without boundaries. From its modest beginnings, Habatat has grown into what is regarded by many as the premier glass gallery specializing in the finest works of contemporary glass. Inspired by that legacy, I opened Habatat Galleries Chicago in 1996 with its founder, Ferdinand Hampson. As an art dealer, I strive to create an atmosphere that encourages imagination, freedom and purpose. Elegant settings for Chicago's Premier events. A large selection of discount wedding shoes. 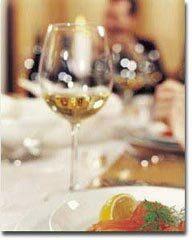 For more than a decade, J&L Catering has been one of Chicago's most celebrated catering services. From private entertaining to executive food service management, J&L continues to bring freshness and creativity to Chicago's catering market. J&L Catering was founded in Chicago's River North neighborhood in 1989. With more than 20 years of food service experience and a life-long passion for great food, owners Ted Grady and Kevin Kelly continue to bring freshness and creativity to Chicago's catering market. J&L has become known for its original and exciting cuisine and for the ability to work in a variety of settings where both precision and flexibility are essential to meet a client's changing needs. J&L has experienced robust growth and is a financially sound company. J&L is owner-operated and has more than 40 managers, chefs, and event designers, and on-premise service personnel for the corporate accounts we manage. Our service staff for all private events is personally recruited and trained by J&L management. These individuals, many of whom have been associated with J&L for more than five years, currently number more than 60, including captains, waiters, bartenders and chefs. Our professional staff is personable and stylish, providing experienced and efficient service to our clients. Typically, J&L will provide a full range of services for your event, including event management, tabletop design, a professionally trained staff, a complete bar package, entertainment, decor and floral arrangements. Offers large selection of engagement rings, wedding bands,bridal registry and flatware. Representing every lettuce restaurant for wedding's and special events in the Chicagoland area. Customizing of all menus the best parties in the city, a one-stop shop. Chicago airbrush makeup artist for bridal on location. In house party wedding facility for 150 people for a whole sit-down dinner and off-site wedding catering. 17th & 18th C. English formal and country furniture. Specializing in custom made diamond engagement rings,featuring yellow and red gold, platinum jewelry. ©2002-2007 Abstract Publishing. All Rights Reserved.